ComputerArts needs your help to find a new name for our company. Tell us your best ideas and win dinner & drinks for two at a top Copenhagen restaurant like MASH, Geist, Sticks‘n’Sushi, The Market or PS Bar. Our competencies have expanded and evolved past graphic arts and layout, into a 360 degrees visual identity powerhouse. After 10 years in the business, we have so much more to offer! Use your creative mind and positive business experiences to brainstorm a new name for our company. Please send your suggestions to brainstorm@computerarts.dk and you could be enjoying a luxury meal in Copenhagen, on the house, in return!! ComputerArts is a design consultant agency. We specialize in design, concept creation, marketing, communications, brand identity – both online and on print. Our projects have a wide range of tasks, ranging from designing brands, visual identity, logo design, shop front design and street signs, posters, brochure design, book covers and layouts, product label design, to online newsletters and websites and web solutions. We want our brand name to represent our portfolio – share your great ideas with us! The name has to work in Danish and English equally. The name must be easy to understand, pronounce and remember. The name must be fit to represent an agency or bureau – it should sound professional and international. The name should somehow indicate our products, services and concept. With an abstract name like “Twitter”, a descriptive tagline under it for example “short messaging system” is appreciated. The competition deadline is Wednesday the 24rd November at 21.00 CET. You can enter as many times as you like! Happy brainstorming! We can’t wait to see your suggestions! *Meal for 2 specified at: MASH, Geist, Sticks‘n’Sushi, The Market or PS Bar. The winner decides. The voucher is valid up to 1000 DKK**. See terms & conditions for more details. Closing date for entry will be 24/11/2016 at 21.00 CET. After this date and time, no further entries to the competition will be qualified. There is no entry fee and no purchase necessary to enter this competition. No responsibility can be accepted for entries not received for whatever reason. The winner will be notified by email and on Facebook after Friday the 25th of November. If the winner cannot be contacted or does not redeem the prize within 14 days of notification, we reserve the right to withdraw the prize. The prize cannot be exchanged for cash. ComputerArts and the competition winner will arrange the details of which restaurant is preferred and the basic logistics as necessary. **The prize is valid up to 1000 DKK and can be enjoyed at the listed restaurants only. ComputerArts is not liable for additional charges during the meal in excess of the 1000 DKK as specified and agreed. Should any additional costs incur in connection with the dinner than the agreed 1000 DKK, the winner will pay on their own accord. Similarly, if the bill for the meal is below the agreed 1000 DKK, ComputerArts is not liable to pay out the difference in cash or any other voucher. The competition winner must provide a copy of the receipt for ComputerArts as evidence for the meal and the agreed terms. This promotion is in no way sponsored, endorsed or administered by, or associated with, Facebook, Twitter or any other Network. The entrants provide their information to ComputerArts and not to any other party. ComputerArts will have the rights to your shared ideas when you enter this this competition, should we later decide to use the ideas provided. ComputerArts will judge the competition and decide on the winner. ComputerArts ‘s decision as to those able to take part and selection of winners is final. No correspondence relating to the competition will be entered into. ComputerArts shall have the right, at it’s sole discretion and at any time, to change or modify these terms and conditions, such change shall be effective immediately upon posting to this webpage. ComputerArts also reserves the right to cancel the competition if circumstances arise outside of its control. Participants e-mail will be subscribed to our newsletter when participating and it’s possible to cancel the subscription in the footer of the newsletter. Logodesign so that your company would stand out from the crowd and not look like every other competitor in your line of business. Photoshopped photos – Make sure your photos and products stand out. Your photos will look dull and make your product and website look bad and you will look as an amateur. Fast servers – if you choose a slow hosting server for your website it could be fatal for your visitors and google would not like your website and therefore your website would only be found on page 7438748 on Google!! Server load speed is important for “SEO” (Search engine optimization). SEO Plugins – Most important when you want to be found on Google and no it does not make your website a success tomorrow but maybe it will in weeks or months. But not paying for SEO is like opening a store in the dessert – no one will know about your products or services. With great SEO work you could actually have the best webshop and get rich even if your store is located in no mans land! Language packs – multiple languages on your website could make you sell more or get more hits and popularity on Google and other search engines. Google Analytics – a plugin that will give you information about who your visitors are and what they click on and a lot of statistics. Security solutions like anti-hacker plugins – will make it almost impossible for hackers or virus to ruin your beautiful and successful website. Well written text and great communication – yes often clients will send their own texts for their website but often the text is not “Web ready” which means it might be too long or to hard to understand or maybe not formatted correctly to be read on a website. Studies has shown that visitors on a website reads content and text differently than if they had a magazine or a book. That’s why we often help bettering the text and content when delivering successful websites. Social media plugins – In todays world when you need promotion or want to be famous for something the most important thing is to have fans and “followers”. Thats where we help you integrate your website on social media platforms like Twitter, Facebook, Google+ (Very important for SEO), Pinterest and Instagram. We often setup autoposting features so when you update your website all your fans and followers will get notified of your new products or news and links will lead them to your website or webshop where they can buy your products. Newsletter plugins – even more successful than social media is still e-mail marketing. We help you make sure that your clients can signup for your newsletter so you can tell them all about your company and bestselling products or whatever you think might interest them. A must have for active and successful business. Webshop solution plugin – where you can easily sell your products online even when you are sleeping. Doesn’t that sound convenient to earn money while you sleep? Contact forms – an easy way for your customers to reach you by mail without having to be on their own personal computer with e-mail setup. This way any potential client can always contact you without any hassle. Customized themes and designs – Without this your website would look like any other website and often in low budget websites you can only choose to change a color of a menubar. But what if you want to change the menubar or the font-type entirely? Then you need to be able to customize your theme or design of your website to make it fit your brand and visual identity. Mobilefriendly / Responsive website – this is a MUST HAVE when building a website because if you don’t then you could loose most of your potential customers because when they surf your website from a phone they will not be able to see an information or product very well if you don’t have a Responsive website. With a mobile-friendly website your content on your website will automatically be formatted to fit your customers smartphones so they can purchase or read about your products. Business who do not have this feature can loose most of their online sales and clients. I have seen it happen – unfortunately. Don’t make the same mistake. I could mention many other great features but as projects and clients are different and have different wishes and expectations I will let it be up to you to find out what features you want on your next website. Why does a pre-defined budget make all the difference? There is no doubt that you can always built features in or on top of your website later and then just start with the basics – but this can be costly in the long run and also cause unforeseen troubles on your site. 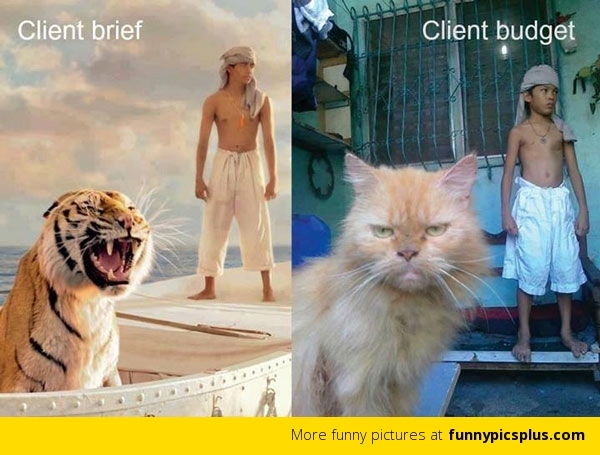 You get what you pay for and this is why it can be hard for a client with no knowhow about a website production. I hope this will help you with your next website project. Always reveal a budget – this will help you get more in the end. And also always trust the designer and programmer to not rip you off – most of us a honest freelancers and businesses who love what we do with goals of making great projects and having longterm happy clients. Are small agencies are better than big agencies? Do you want to know why smaller companies often are more passionate and service minded than bigger companies? Because we care! We always feel guilty when asking for more money than our products are worth. Actually our biggest mistakes is often that we don’t charge enough because we often feel that we will scare the customers away. We feel responsible for the impact the designs makes on your target group, we a passionate about your brand, we strive to make you happy even when it sometimes takes more time that we anticipated. We love when clients are happy and we often have a harder time selling our own products thus we always think the price is what matters. All these things are great reasons to work with smaller creative agencies and freelancers – we just care more and we don’t send out of best seller, to just raise your budget. No we actually always try to fit more content into your budget. Actually I have seen many bigger agencies and web companies rip off their clients for thousands of $$$$ and often they hire small and cheap freelancers to do their dirty work and then sell it to their own clients for 10 times as much as they have paid. I guess it’s a fair enough way to do business to outsource but if you ask around you will find freelancers that are cheaper and who provide much more service as big agency businesses. I have also seen websites that clients have paid 500.000 dkk (half a million) for and that I could have made for maybe 300.000 dkk. Thats a discount of 200.000 dkk that agencies rip you off for. I’m sure that there are fair agencies and big graphic design companies out there who actually are fair with pricing and service but there are less out there that you would think! Hire small graphic design businesses instead and you will get much more value for your money. But be aware of small freelancers that don’t care to send out a contract before they start the project – this could be the cause of total failure as it often leads to disagreements. Make sure you have everything in writing and always care to ask “does it cost more or is it included in the budget?” so you don’t get a stroke when receiving the bill in the end. Most professional programmers and designers always ask for a 50% payment upfront – this is very common because this shows faith and that both parties trust in each other – best case is that the designer and programmer is totally focused on you assignment because they have already booked your assignment into the calendar and they will prioritize your project. Often many freelancers will not start a project before getting an upfront payment to show that you are serious. This is always a good sign of professionalism and much experience dealing with projects and customers. Remember it’s not always about the price and budget but about what you expect vs what is possible within your budget. Get ready to compromise when you have a low budget. Expect more when you have a high budget. I would actually recommend that you ask your upcoming freelancer or agency of 3 price quotes to find out how much website you can get for example for 8.000 dkk, 15.000 dkk and 30.000 dkk. This will help your get a good idea of what is possible within various budgets. Find a designer you like and trust and always be honest but fair if you have disagreements or if you are unsure you should always ask questions to make sure that you understand the process and contract. Make it clear in your brief what you want but always make room to compromise. If you don’t know anything about web production then you should inform your freelancer or agency of this so they can help you understand the process. If you don’t care about understanding the process or don’t have time for it – then do yourself a favor and back off as much as possible and inform your hired freelancer or agency that you trust them to make the best possible solution for you within your expectations and I am sure they will. Always bargain if you order more than 2 products. Sometimes you get better prices when ordering more – this could be a perfect way to order an all-in-one solution where you don’t have to shop around for better prices but just let the freelancer or agency to take care of everything for you. A win win solution 🙂 Good luck with your next project and don’t be afraid to share your budget before starting the project. – written by graphic designer, Mark Barner. På vores kontor sidder en dygtig fotograf, nemlig Claudia Dons. Efter mange års erfaring og med en voksende kundegruppe, var det tid til at genopfriske logoet og den visuelle identitet. I samarbejde med Claudia Dons og mange forskellige logoforslag, kom vi frem til at blive inspireret af en såkaldt “finder” til brug i hendes logo. En finder er det “kryds” som fotografen ser igennem sit kamera, som svarer til “sigtekornet” inde i kameraet. Efter en god gennemgang af mulige skrifdesigns valgte vi den ovenstående. En visuel identitet både online og offline er i dagens verden, ekstrem vigtig. Et logo skal bruges korrekt og Claudia Dons fik mange forskellige størrelser af logoet, til brug på de sociale medier. Vi fandt i tæt samarbejde frem til en af de mange billeder, som er med til at understøtte en stemning og stilart i hendes brand og identitet. Vi brugte derfor ofte dette billede, som baggrund på de forskellige sider og de sociale medier. Claudia Dons er social, eller rettere på de sociale medier. I dag er det, som virksomhed og selvstændig ikke nok kun at være aktiv på eet social medie. Der er et hav af forskellige sociale medier, som er velegnet til at promovere sig selv. Vi oprettede og opsatte derfor, i samarbejde, følgende sociale netværk for at optimere Claudia Dons Photography online: Google+, Twitter, Facebook side, Instagram, Vimeo, Youtube, LinkedIn, og Flickr. Du kan se nogle af hendes profiler afbilledet herunder.